Whether it's summertime, you always learn at home, or you need some extra practice, free printable math pages are the best, inexpensive way to get learning. The simple Even or Odd Math for Kids printable is perfect for keeping up with your lessons or getting a step ahead of the crowd. 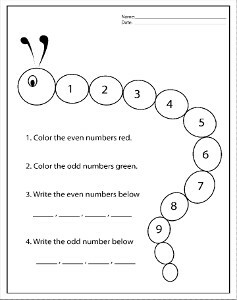 Free kindergarten worksheets like this one are great for the more advanced students who need a bit of a challenge. This worksheet can be given to kids as young as Kindergarten or as old as fifth grade. It can serve as an easy review or as a lesson plan if you're just about evens and odds. Free Printable Online offers some of the best printable crafts and worksheets on the internet, all for free! Check us out today at www.freeprintableonline.com.